October 17, 1961: Jackie Fargo & Lester Welch defeated Great Mephisto & Dante for the Southern Tag Team titles in Nashville..
Mid-70s: Jackie Fargo often teamed with his ‘brother’ Sonny “Roughhouse” Fargo, Jerry Jarrett, and Tojo Yamamoto..
Jackie Fargo lost a “Hair vs Hair” match to Al Green and started wearing a mask to the ring to hide his bald head..
January 3, 1980 – CWA: Jimmy Valiant defeated Jackie Fargo to win the Southern heavyweight title. 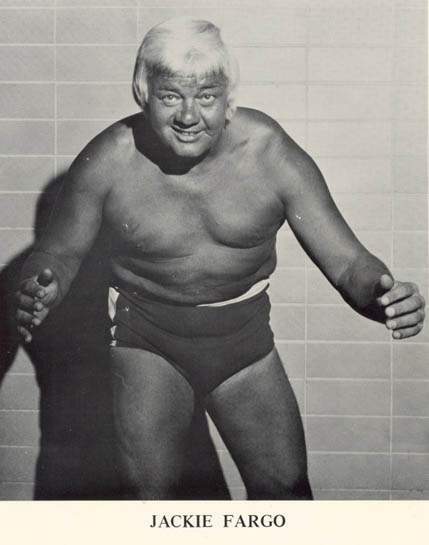 October 12, 1985 – CWA: Jackie Fargo defeated Buddy Wayne. Jackie Fargo appeared on the first few NWA: Total Non-stop Action Pay Per Views..
June 16, 2006–Clash of the Legends III: Jerry “The King” Lawler defeated Doug Gilbert w/Jackie Fargo..
September 16, 2006–Big Time Wrestling: Jackie Fargo, Jeff Justice, and [INSERT] beat Beau James, Tom Prichard, and Sheik of Araby. October 30, 2004 – Memphis Wrestling: Cory Macklin, Jackie Fargo & Stan Lane defeated Jerry Lawler & The Rock ‘n’ Roll Express (Ricky Morton & Robert Gibson). June 24, 2013 – Jackie Fargo passed away at the age of 85.